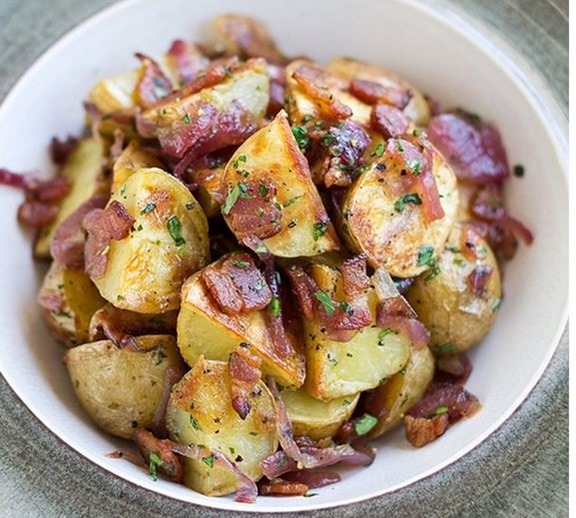 1) Steam potatoes, toss with butter and spices, salt and pepper. Roast, uncovered, for 30 minutes. 2) Toss onions with melted butter, grill onions on the grill. this is easy if you use stainless steel basket designed to grille fish. Or you can roast them in the oven with melted butter until starting to brown. Stir occasionally. 3) Cool potatoes and onions. Crumble bacon and add bacon and the bacon grease to the salad. Add mayonnaise to desired moistness. Add lemon juice, Dijon mustard, salt and pepper, peas. Toss gently.